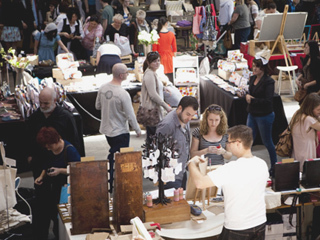 Finders Keepers is an Australian Fashion, Indie Design and Art Market with over 150 designers and artists displaying their goods in a massive warehouse space. It is on twice a year in Melbourne. Indie Design is short for independent design and refers to niche and often handmade products. Finders Keepers is one of the top Australian designers markets, with original works by some of the best emerging designers.
. and a bar, lots of great food, live music and an art exhibition. Some of the special features of the market are: A drawn from fashion exhibition showcases emerging Australian designers, young fashion illustrators and artists, and their creations of original art works - bridging Australian Art and fashion. There are inexpensive beautiful art prints for sale that support international flood and earthquake appeals. You can interact with unique paper installations and discover the joys of exploring paper and paper artists.